The tallest building in the world or the tallest tower in the world. Since man walks the earth, he attempts to dominate his surroundings and shows his assumed supremacy by creating tall and large buildings. The Egyptian pyramids, the Roman colosseum, the medieval cathedrals, they all served the purpose of expressing and confirming the dominating position of those who built them. Apparently, creating the largest or the tallest building in the world is strongly connected with the most dominant powers of their time. Now, why is building the largest or tallest tower in the world such a logical feature for powerful nations? 1. Creating the tallest building in the world costs a tremendous amount of money. Therefore only powers that have accumulated enough quantities of money can afford to systematically build tall and large buildings. Some regional powers manage to make one incidental gesture (like the Petronas Towers in Kuala Lumpur), but their economical strength doesn't allow them to repeat this very often. Even very poor but centrally governed nations can give it a try. For example North Korea. 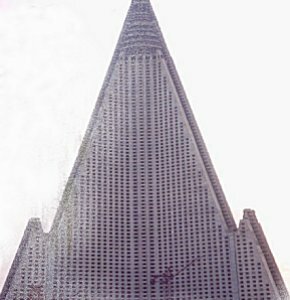 In 1992 Pyongyang built the Ryugyong Hotel. With 104 floors and a height of 330 meters, it was one of the tallest buildings in the world in the early ninetees. The North Korean rulers obviously intended to impress the world with this huge hotel. But it was beyond their means and the hotel was never finished. It stands now for over 13 years as a massive concrete shell in the very heart of Pyongyang and it was never used. The Ryugyong Hotel in Pyongyang (North Korea) and the Vatican Replica in Yamoussoukro (Ivory Coast). A more lucky example of this phenomenon can be seen in Yamoussoukro, a village in the African Nation of Ivory Cost. 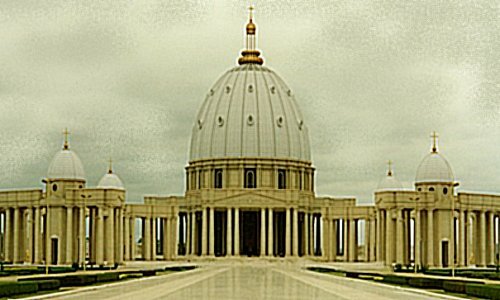 Former president Felix Houphouet-Boigny was born in Yamoussoukro and thought it to be a good idea to built a replica of the Vatican in his home-village. Although this is by far not the tallest building in the world, this jungle cathedral is even taller than the original! Now this example is indeed completed but it so extremely expensive that building it has significantly enhanced poverty in Ivory Coast. 2. Building the tallest tower in the world can be very useful to impress and intimidate competitors and citizens. The Pyramids of Egypt are very clear examples of intimidation. They were built to express the relation between the pharaoh's and the gods. Who would want to contradict rulers that were so close to the gods? 3. History shows that extreme buildings often had military significance in a very practical sense. The wall of China and the medieval European castles were used to protect the ones that ruled the nation. 4. Although creating extremely large or tall buildings is very costly, it also can provide large revenues. The tallest towers in the world always have been the center of economic development and usually attract businessmen, diplomats, tourists and artists from all over the world. So in fact, extreme buildings can not only be deployed to express and establish power, but also to maintain and accumulate it. The explanation above in principle shows that there is a logical relationship between extreme power and extreme buildings in a way that the tallest buildings in the world serve the powers that be. However, power nor buildings are forever. More specific, a decline in creating tall buildings is usually followed by a decline in power. History shows that all nations or regions that systematically have created tall or large buildings sooner or later will dominate their surroundings in an economical, political and military fashion. History also shows that a reduction or even a hold in systematically creating large and tall buildings is the dawn of rapidly fading power. Especially when another power is taken over the initiative of creating the largest and tallest buildings in the world. In ancient history, the Egyptians dominated the middle-east and beyond for centuries. Their pyramids have been the largest and tallest buildings in the world for ages. But at the peak of the Egyptian empire, the Romans started building their colosseums, aquaducts, villa's and forums. It wasn't the exact size of the individual buildings that was so much impressive (although the colosseum in Rome was one of the largest buildings of its time). The importance of the Romans was that they were the first civilization that integrated their buildings in an advanced urban design, thus creating the first examples of modern urban planning, combining all sort of impressive buildings, squares and boulevards as a chain of power. On top of that, the Romans developed superior technology and building management, resulting in collective water-, heating- and sewersystems. The design and technology of the Roman architecture and urban design was so advanced that they surpassed the Egyptian level. Soon afterwards the decline of the Egyptian empire commenced and the Roman empire took hold of the dominant position in Europe and the Middle East. So their boost in building activity was followed by a shift of dominance from the Egyptians to the Romans. The Romans have dominated Europe and the Middle East for centuries. But their grip on local powers like France, Germany and England was troublesome. During the early medieval times, the Christian churches in those countries found ways to establish more power that was reflected in a series of huge cathedrals. Some of them haven't survived centuries of war and decay, but others are still standing today in their original splendor. These cathedrals, for example those in Rouen (France) and Strasbourg (France) took over the title of the tallest buildings in the world. For the first time in 5000 years, man had built something taller than the pyramids! By that time the Roman Empire was over, and a new world order had emerged. As of that moment, it was a group of western European countries (Spain, Portugal, The Netherlands, France, Germany and Britain) that formed a accumulation of power this world had never seen before. Although Europe was host to numerous wars, this group of nations managed to become the most powerful region on earth for about 500 years, and for the first time in history, one super-power dominated the entire planet. Thanks to advanced ships and weaponry, Europe started to colonize the rest of the world. Between 1450 and 1950, the large parts of North and South-America, Africa, Asia and Oceania were European colonies. All the wealth that was the result of this colonization was materialized in the most fantastic buildings the world had ever seen. The Saint Peters Cathedral (Rome), The Versailles (Paris), The Houses of Parliament (London), and so on. Europe became a huge open air museum and a lot of the glorious buildings that have been built in that period can still be seen and visited today. At the very peak of European power, France completed a structure that dwarfed all other structures in the world; The Eiffel Tower. It was twice as tall as any other building on the face of the earth. But at about the same time, something very important happened in the USA. In 1884 the Home Insurance Building was completed in Chicago. Where the Eiffel Tower was in fact no more than an open steel frame, Chicago's Home Insurance Building was a real building with walls, floors and a roof on it. One could actually work in it without caring about wind or rain. Because it only had 10 floors and was no more than 38 meters tall, there was little attention for it in Europe. But soon afterwards, a building boom emerged in the USA, resulting in taller and taller buildings. During the end of the 19th century the USA was the worlds single supplier of skyscrapers and it dominated the race for the title of the tallest building in the world. This battle wasn't between nations, but between cities, New York and Chicago to be precise. In 1931 New York City completed the Empire State Building. It was by far the tallest building in the world and it kept that title for over 42 years! The birth of a new super-power was materialized. Even today, 74 years after completion of the Empire State Building, Europe does not house a skyscraper of that magnitude! During the decades after 1930, the economic, political and military power of the United States of America was growing rapidly. This power was expressed by systematically building tall buildings on a very large scale. Even when the world finally saw buildings that were taller than the Empire State Building, they were built in the USA. Have a look at the table above. It shows the tallest buildings in the world in the year 1980. Note that only buildings with walls and floors are included and not for example steel or concrete TV Towers. In the year 1980, the list of 20 tallest buildings in the world contained 19 buildings in the USA, and 1 in Canada. Many of the USA skyscrapers were even taller than the relatively easy-to-built steel towers like the Eiffel Tower. The tall buildings list above is an accurate reflection of the economical, political and military power of post World War II USA. But as of 1996, the list of tallest buildings in the world dramatically changed. Asian nations such as China, Malaysia, Taiwan and South Korea have become so rich, that they needed to invest their capital into solid rock. At first they bought half of the San Francisco and New York skylines, but later on they figured it was more clever to do an other trick. By hiring the best USA architects and builders they transformed their cities into surreal post-modern landscapes. If you look at the table below, you will see that in 2005, most of the tallest buildings in the world are in Asia. In 25 years the list has completely changed! The result is that in the year 2005, Asia rules the high-rise statistics. No less than 8 of the 20 tallest buildings in the world are now situated in China, 16 are in Asia and only 4 of the 20 tallest buildings in the world are in the USA. The Empire State Building, being the grand old lady of skyscrapers and for more than 42 years the tallest building in the world has now dropped to a modest 9th place. The Chrysler Building, for a brief period the tallest tower in the world, has completely vanished from the list. What a dramatic change since 1980! But that's not all. All over the world there are plans of building more extremely tall buildings. Some of them are already under construction. If we add those buildings that are under construction to the list, the drama gets even more intense as you can see in the table below. As you can see on this list, in the year 2010, the list of the 10 tallest buildings in the world will contain 9 Asian buildings and only 1 USA tower. Sears Tower in Chicago will be fallen to the 9th place by that time. Note that in 2010, the Arab world will have made significant entries in the list. Of course, chances are the USA will build Freedom Tower in New York City. But at this moment, construction has not started yet and is delayed. As we explained earlier in this article, the list of tallest buildings in the world can be seen as a pretty good prediction for the global situation of economical, political and military power in the future. So skyscrapers tell us the USA will lose its dominant position in the world. According to the lists above a new world order will arise. In that near future, the regions around the China Sea and the Arab Sea are the powers that will dominate the world with their economical, political and military force.